WillaCatherLibrary is a Legacy Library. Legacy libraries are the personal libraries of famous readers, entered by LibraryThing members from the Legacy Libraries group. WillaCatherLibrary is also an author. 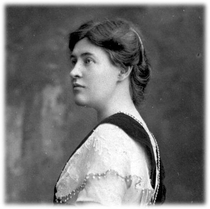 » See Willa Cather's author page. Born in western Virginia in 1873, Willa Cather spent the first nine years of her life on her family's Shenandoah Valley farm. After a series of financial setbacks, Willa Cather's parents sold the Virginia farm and headed west to join family members, who had set up homesteads on the Nebraska prairie. That journey, by train and by overland wagon, made such a strong impression on the young Willa that 35 years later she based the train journey of Jim Burden, the narrator of her fourth novel, My Antonia, on it. "This country was mostly wild pasture and as naked as the back of your hand. I was little and homesick and lonely and my mother was homesick and nobody paid any attention to us. So the country and I had it out together and by the end of the first autumn, that shaggy grass country had gripped me with a passion I have never been able to shake. It has been the happiness and the curse of my life." It has also been the setting of six of Willa Cather's twelve novels and of many of her short stories. In 1890, Cather enrolled in Lincoln State University (now the University of Nebraska) in Lincoln, Nebraska. While attending the university, she helped support herself by working as a journalist. It was also during these years that she began writing and publishing short stories. Cather graduated in 1895, and after an anxious six months at home in Red Cloud, found a job editing a magazine in Pittsburgh, Pennsylvania. Her Pittsburgh sojourn lasted 10 years, during which time she worked as a journalist, editor, free-lance writer, and high school teacher. In 1905, The Troll Garden, her first collection of short stories, was published; the following year, she moved to New York City where she worked for six years as the managing editor of McClure's Magazine. After the publication of her first novel, Alexander's Bridge, Willa Cather resigned her editorial position at McClure's to write full-time. Over the next three decades, she published 11 more novels, four collections of short stories, and two volumes of essays. These include: O Pioneers! (1913), The Song of the Lark (1915), My Antonia (1918), Youth and the Bright Medusa (1920), One of Ours (1922), A Lost Lady (1923), The Professor's House (1925), My Mortal Enemy (1926), Death Comes for the Archbishop (1927), Shadows on the Rock (1931), Obscure Destinies (1932), Lucy Gayheart (1935), and Sapphira and the Slave Girl (1940). In 1922, Willa Cather won the Pulitzer Prize for Literature for her novel One of Ours, and in 1933, she was awarded the prestigious French literary award, the Prix Fémina Américain. In 1944, the American Academy of Arts and Letters presented her with its Gold Medal. This image has been cropped from a larger, full-length photographic portrait, which was taken in the early 20th century at the Fifth Avenue studio of photographer Aime Dupont. The current owner of this photograph has granted permission for its use here. About my libraryOver the years since Cather's death, books from her personal library have found their way into a number of public, academic, and personal collections. Please bear with us as we locate and record the books in Willa Cather's personal library. "She bought Stevenson's complete works, the first large set acquired, paying for it at the rate of a dollar a month. At the time of her death the 'Stevenson' occupied a shelf conveniently accessible to casual reading in the living-room of her apartment. Like the rest of the reading that was important to her as an undergraduate, it was important to the end."